Gaining weight? Feeling depressed or sluggish? Is your hair falling out? Have you experienced strange or irregular heartbeats? Can't sleep? And does all this seem to be coming out of nowhere??? Thyroid conditions, from hyper- and hypo-thyroidism to Hashimoto's and Grave's disease, affect more than 20 million Americans — and that number is conservative. Of the at least 20 million people with a thyroid problem, upwards of 60% are undiagnosed or unaware. Women are 5 to 8 more times likely to develop a thyroid condition than men. Undiagnosed thyroid disease puts one at further risk for cardiovascular disease, osteoporosis, and infertility. Although the thyroid gland is very small compared to most other organs, it produces a hormone which influences every cell, tissue, and organ in the body! The thyroid is truly a miracle. This butterfly-shaped organ lives in your neck along your windpipe. It weighs less than an ounce and is made up of 2 wings, or lobes. The lobes are joined together in the middle by a small piece of thyroid tissue called the isthmus. It's like a dance, and every step has to happen in perfect order and synchronization in order for the dance to be successful. Hundreds of processes, enzymes, nutrients, and hormones all work together so that the brain, thyroid, hormones, cells, and even our DNA play their part in each step of the dance. First, in the brain, the hypothalamus senses that cells need thyroid hormones, so it produces Thyroid Releasing Hormone (or TRH). That then tells the pituitary gland to produce Thyroid Stimulating Hormone (or TSH). TSH travels to the thyroid, signalling it to produce T4. Since T4 is the inactive form of thyroid hormone, the body can't use it until it is converted into T3. Once this happens, T3 has to get inside each and every one of our cells, into the DNA to bind to a tiny nuclear receptor so it can regulate metabolism. When cellular metabolism increases, the entire body's metabolism increases. (Source and source). And, a healthy metabolism = normal body temperature, healthy hair, skin, and nails, hormone balance, steady mood, healthy sleep patterns, and regular bowel movements. Obviously, ALL of these nutrients are found in whole foods. But also obviously, isolated forms of these nutrients are also found lining the shelves of grocery and health food stores worldwide, not to mention Amazon. Rather than taking a bunch of pills to nourish your thyroid, doesn't it make sense to eat nutrient-dense foods instead? Thyroid problems can be genetic, yet they are also brought on by poor diet and lifestyle choices, extreme stress or trauma, and compromised gut health. While you can't control your genes, you can control what you eat. This list is by no means exhaustive. 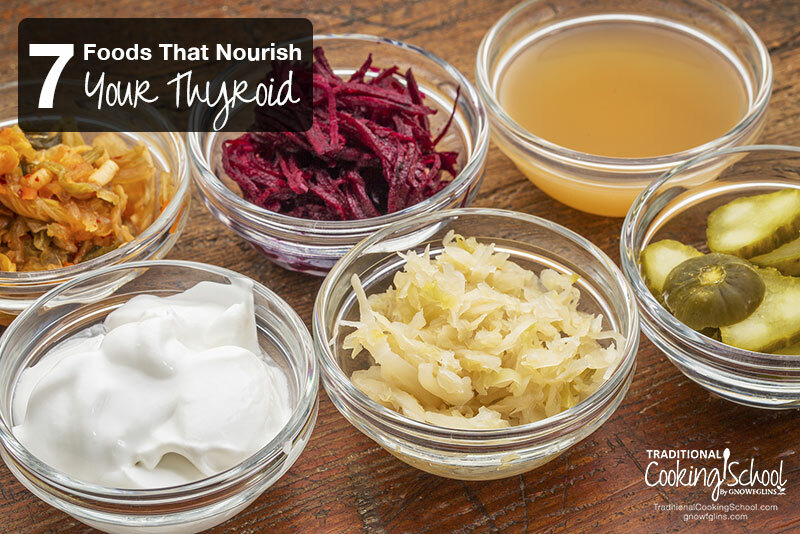 There are so many wonderful foods that nourish the thyroid! 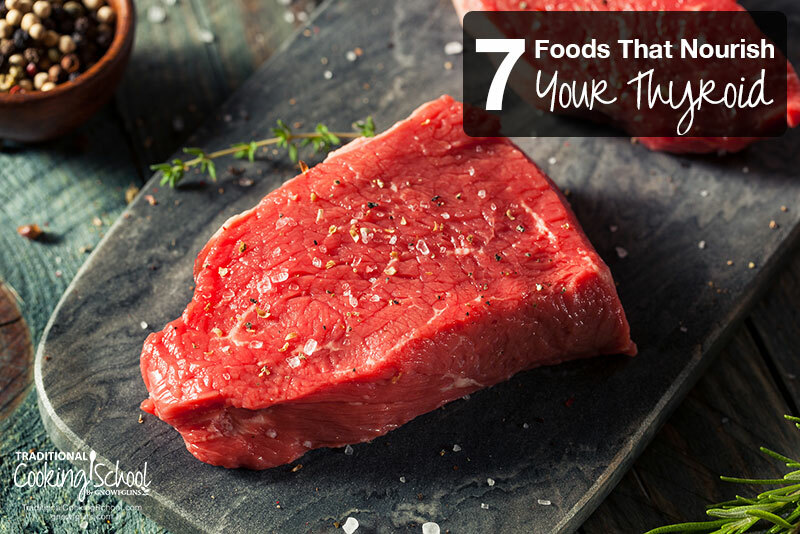 Yet, comprehensively, these foods contain all 10 of the essential nutrients required for healthy thyroid function. 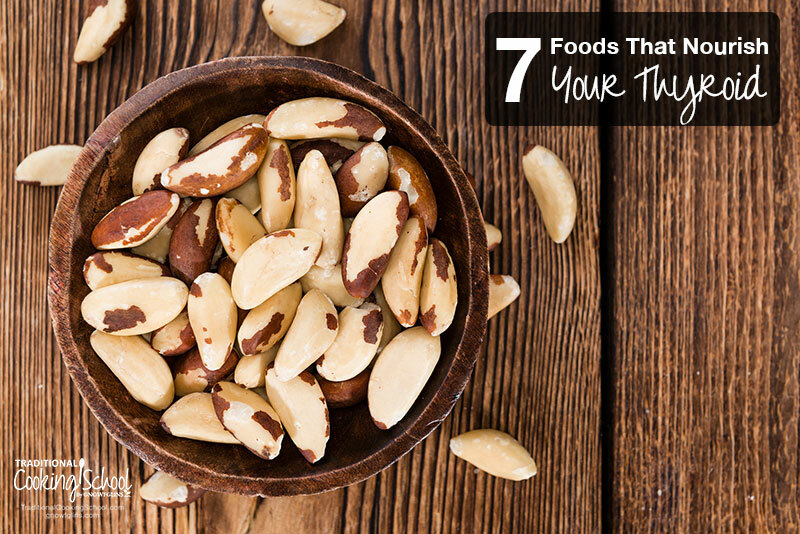 Brazil nuts are one of the highest food sources of selenium, an essential mineral for thyroid health. Even a mild selenium deficiency can lead to the development of autoimmune thyroid diseases (source). Brazil nuts are actually not nuts at all; they are the seeds of the Brazil nut tree! And don't think you need to eat a handful every day. In fact, just 1 ounce of Brazil nuts (7 to 8) contains 544 micrograms of selenium — WAY too much (source)! Adults 14 and older need about 55 micrograms of selenium per day, while pregnant women require 60 mcg and breastfeeding women 70 mcg (source). So, 1 or 2 Brazil nuts per day is sufficient to maintain healthy selenium levels, and hopefully, keep your thyroid happy! Of course, as with all nuts and seeds, the benefits of Brazil nuts are more usable if they have been sprouted or soaked and dehydrated first. These processes reduce the anti-nutrients which prevent mineral absorption. You can purchase raw Brazil nuts to soak and dehydrate yourself (here's how!). Or, you can buy them already soaked and dried! Why Is Selenium So Important? First, selenium is essential for the conversion of T4 to T3. Even if the body is producing sufficient T4, it cannot be utilized until it is converted into T3 — the active form of thyroid hormone. Low T3 levels can cause hypothyroid symptoms (source). Second, selenium has shown anti-inflammatory effects on thyroid-specific autoimmune diseases, such as Hashimoto's. Reduced inflammation reduces the risk of thyroid tissue damage over time (source). Finally, selenium has been shown to prevent depression — a common occurrence in people who have impaired thyroid function. A good mood has a lot to do with the level of seratonin, the feel-good brain chemical that regulates mood and also effects sleep quality and appetite. In this study, a group of participants ate selenium-rich nuts, including Brazil nuts, for 12 weeks while another group of participants avoided these nuts for the 12-week trial. The group who ate the nuts had higher seratonin levels after eating the nuts than the group who did not. Sea vegetables — like nori, kelp, dulse, kombu, wakame, and more — are rich sources of iodine! Seaweeds are one of the most naturally concentrated sources of iodine. And they provide other trace minerals as well, including iron, calcium, and potassium (source). Sushi is a fun and easy way to consume seaweed. Depending on how you purchase sea vegetables, they can also be used as a garnish on soup or salad or simmered to make a mineral-rich broth. Herbamare is a delicious seasoning blend with sea salt, dehydrated herbs, and kelp. Free from MSG and preservatives, Herbamare is like salt on steroids! The recommended daily amount of iodine for healthy adults varies from between 150 to 1,100 micrograms. It is possible to consume too much iodine, which also leads to thyroid and other problems. A sick thyroid is an inflamed thyroid. Fats are anti-inflammatory to the entire body, including the gut, skin, and thyroid. 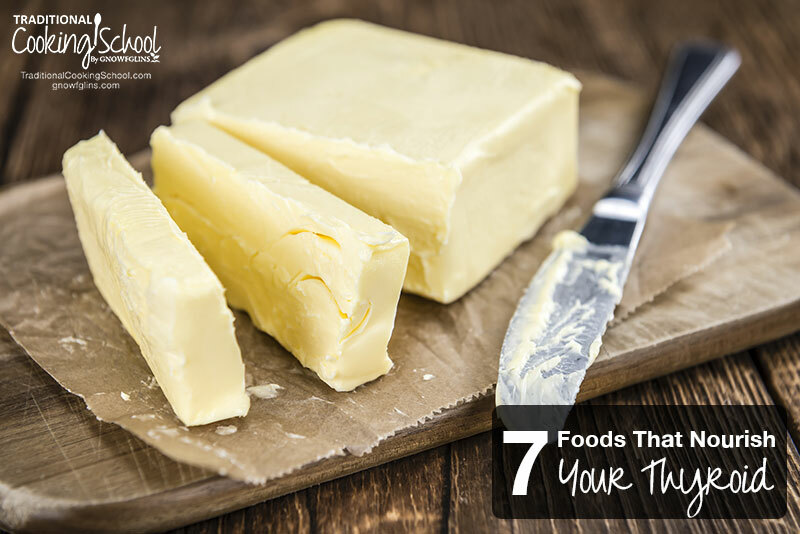 Grass-fed butter and ghee contain high levels of bioavailable vitamin A, a nutrient that supports a healthy thyroid. They also contain cholesterol which is necessary for supporting hormone balance. Along with grass-fed butter and ghee, pastured eggs, cod liver oil, beef tallow, and lard from clean sources contain high amounts of anti-inflammatory Omega-3 fatty acids which calm both the thyroid and body as a whole. Coconut oil also nourishes the thyroid. It actually doesn't contain any of the 10 essential nutrients for thyroid health — but it does contain medium-chain triglycerides (MCTs). These are thermogenic fatty acids that absorb directly into the bloodstream and are used for immediate energy (source). As a result, coconut oil (and its MCTs) reduce inflammation in the thyroid, raise body temperature, and give the body immediate, usable energy! So, it is still an important food for treating a sluggish thyroid and increasing cellular metabolism! How To Easily Add These Fats To Your Everyday Cooking? Swap out margarine with butter or ghee. Substitute coconut oil for vegetable oil in any recipe. Blend coconut oil into herbal coffee, hot cocoa, or hot tea! Eat coconut oil straight off the spoon. Treat yourself to this Nutrient-Dense Peppermint Mocha — with both butter and coconut oil (feel free to replace the coffee with herbal coffee if you prefer). Or, indulge in a cup of Bulletproof Hot Chocolate. It's already caffeine-free, and contains resistant starch! Protein is required to transport thyroid hormones throughout the body. It also stabilizes blood sugar (unstable blood sugar is common in those with thyroid disease). Pastured meats contain glutamine — an amino acid required to rebuild and strengthen the lining of the gut. Why am I suddenly mentioning gut health? Because most thyroid conditions are autoimmune in nature; the body is attacking itself. Healing the gut is an essential part of addressing the thyroid, and the glutamine found in pastured animal proteins helps with gut health (source). Pastured meats provide fatty acids and amino acids essential for proper hormone production and balance. Grass-fed beef and bison are high in anti-inflammatory Omega-3 fatty acids. Pastured chicken and turkey are high in selenium and zinc and also provide a lean protein source for amino acids, blood sugar stability, and glutamine. Wild-caught fish from safe sources are also beneficial to the thyroid because they contain Omega-3 acids EPA/DHA which are necessary for optimal thyroid function and hormone balance (source). These fish include cod, haddock, salmon, mackerel, and sardines. Deep sea fish, like cod, are also very high in iodine. In addition to grilling or roasting these fish, you can also make fish stock out of them for even more amazing thyroid-healing benefits! Check out The Secret Of Fish Stock for an easy recipe. For more in-depth research about why meat is necessary for thyroid healing, see Why You Need Meat In Thyroid and Nutrition Healing. Maca is a special food. It provides energy and vitality — something that people with underactive thyroids desperately crave. Specifically, maca may stimulate the pituitary gland and hypothalamus, signalling them to secrete TRH and TSH (source). Maca brings balance to the entire endocrine system, of which the thyroid, pituitary gland, hypothalamus, and adrenal glands are all part. 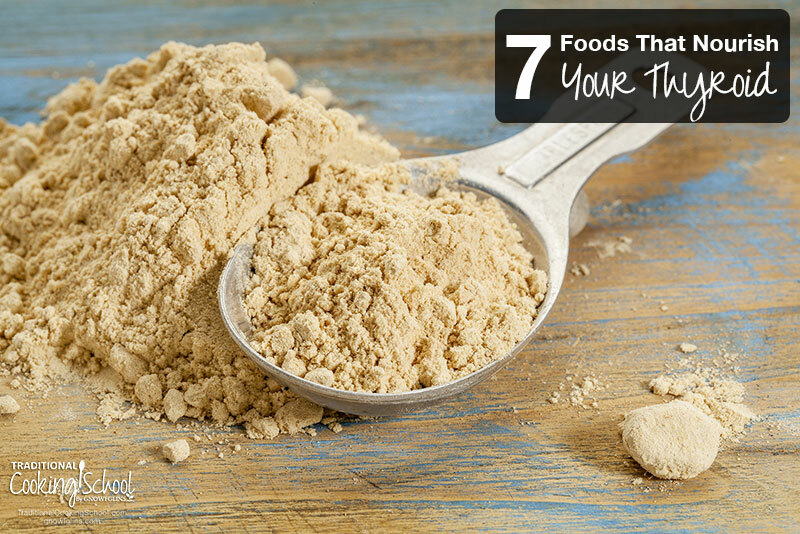 For those experiencing the energy lulls, low libido, lack of stamina, depression, and hormone imbalance as a result of a sluggish thyroid, maca is a nutritional powerhouse. Get double thyroid benefits of coconut oil and maca with this Black & White Maca Mocha and these Maca Gingersnap No-Bake Treats. And here are 30 maca recipes if you want to get your superfood on every day for a month! Since most thyroid conditions are autoimmune diseases, we need to address gut health. The immune system is found in the gut, so when the body begins attacking itself, the gut always plays a role. Not only are they full of thyroid-loving vitamins and minerals, but yogurt, kefir, fermented veggies, and kombucha all help to continuously colonize the gut with beneficial bacteria. We don't have enough room in this article to analyze the nutrient data for every fermented food out there, so let's just include a few. Suffice it to say — eating any traditional fermented foods benefits gut health, which directly relates to the health of your thyroid. Sauerkraut — 4 out of 10: magnesium, vitamin B2, vitamin C, vitamin A + probiotics! Raw Milk Yogurt — 10 out of 10 + probiotics! Kombucha — 3 out of 10: vitamin B12, vitamin B2, vitamin C + probiotics! I mean fiber from fresh vegetables, berries, soaked or sprouted beans and lentils, and sprouted seeds. Fiber helps to stabilize the blood sugar and improves digestive health (source). Constipation is a common symptom of low body temperature and hypothyroidism. So additional fiber is a natural way to remedy this and get your system moving again. 3 to 5 servings of vegetables per day is a minimum. If you can aim for 7 to 9 servings, that's even better! In addition to fiber, vegetables and low-glycemic fruits offer antioxidants, vitamins, and minerals — which are essential for optimum thyroid function, as you know by now. Finally, seek out varying sources of soluble and insoluble fiber — such as listed below. root vegetables and sweet potatoes — try this amazing Root Vegetable Tartiflette! 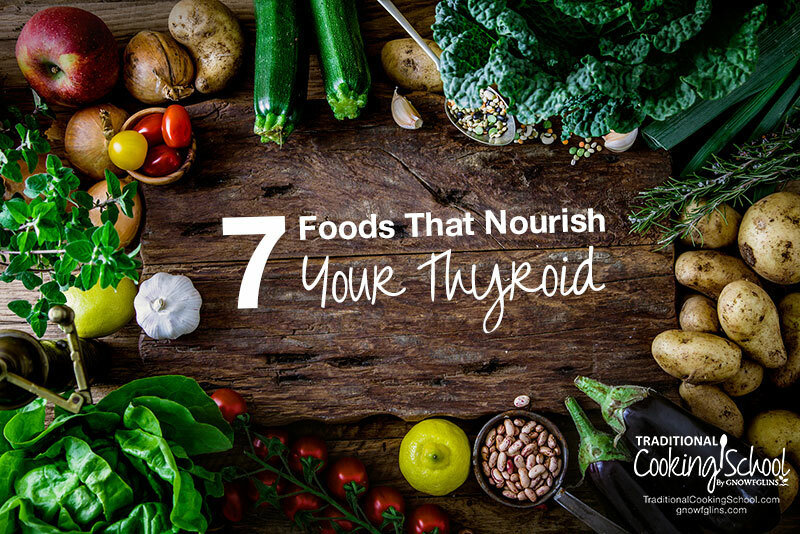 Incorporating these 7 foods that nourish the thyroid into your lifestyle can be a therapeutic step in a holistic thyroid treatment plan. Or, it can be a preventative step, especially if thyroid conditions run in your family or if you've just started having some thyroid-related symptoms. As someone who was diagnosed with hypothyroidism before I turned 30, I know how miserable the fatigue, brain fog, cold hands and feet, insomnia, constipation, depression, and anxiety can be. It took me 4 years of taking high quality supplements and eating thyroid-loving foods, while avoiding the foods that made my thyroid worse. But in early 2016, my annual thyroid blood test came back normal! I was able to heal hypothyroidism without medications and by eating these 7 foods (and avoiding the foods that make the thyroid sick)! Yes, it's hard work! Yes, quitting sugar and caffeine was miserable! Yet the pay off is priceless! 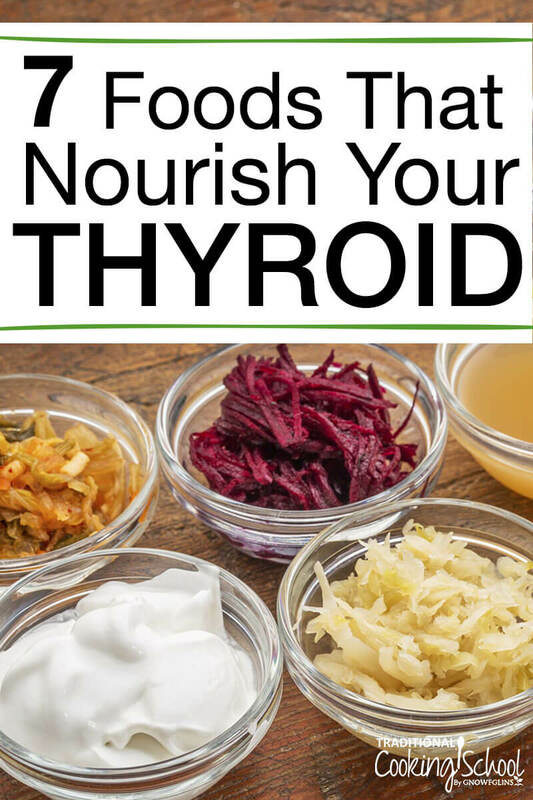 What foods do you eat to nourish your thyroid? What foods do you avoid? 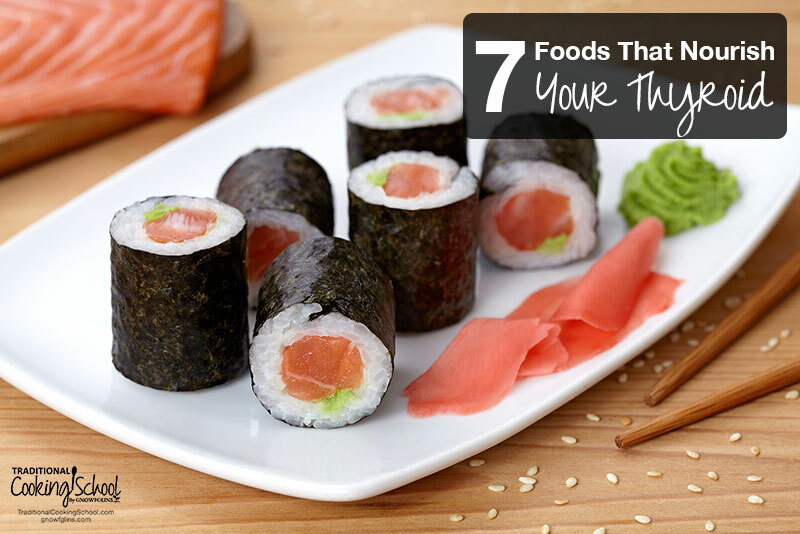 Also see: 7 Foods That Are Making Your Thyroid Sick. What a wonderful memory! Thank you for sharing! I belive it´s very interesting,we are suffering of hipo, and every day it is worst in depression,i will tray thanks for quide. So these foods only help individuals with hypo, not hyper? Thank you so much for your info. This is truly such a gift. Were you ever on medication in the beginning? How did you know when your test were “normal”? Maybe get off the medication and check? I have hashimotos and I’m curious!! It freaks me out to think my body is attacking itself ? I tried a prescription of Armour, but it gave me terrible anxiety and heart palpitations. I managed to take it for 3 days and quit. I also found a doctor who didn’t go by the AMA’s “normal” range for hypothyroid; I found one who knew that the range was too wide and general and who would go by my symptoms. When my TSH started going down, we knew things were getting better. You have mentioned a bunch of crucifers especially maca. As far as my understanding goes crucifers are bad foods if suffering fron hypothyroidism. Please clarify. Wonderful! Thank you so much. Please help with recipe for use of Muca and kombuca as it is totally new to me. It’s really a nice and helpful piece of info. I am satisfied that you shared this useful information with us. Please keep us informed like this.Thank you for sharing.